Alex Michael is an local award winning magician with years of experience with a reputation for offering superb cutting edge magic to enhance any event or party. 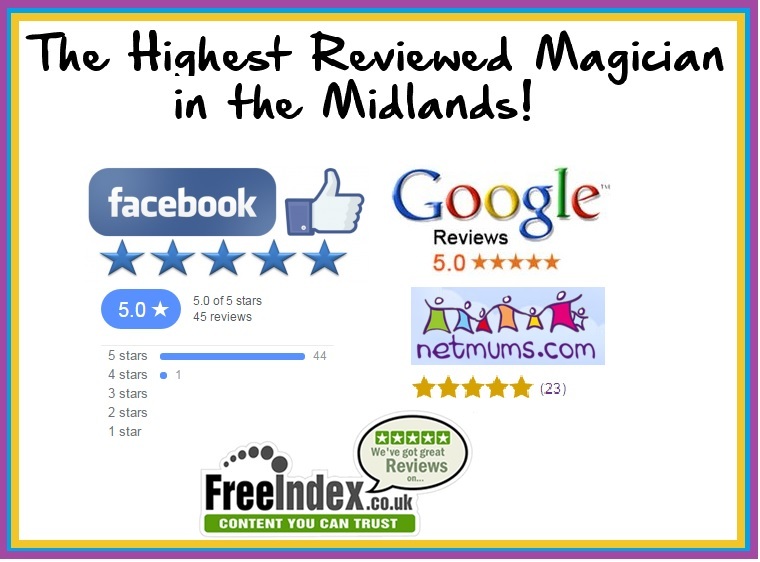 For Adults Alex is regarded as one for the very best sleight of hand table magicians in the Midlands having won many awards and being booked to perform at events all over the UK. Be it a wedding, corporate event or even a private party, Alex will add the wow factor with his fully interactive magic performed with cards, coins, money and borrowed objects. For children Alex has developed a show and magical party packages which have seen him booked well over 100 times per year. Alex offers a variety of options for children. His shows are aimed and 3 years old all the way up to 12 year olds and each show is tailored for maximum effect. The show lasts for 40 minutes and is suitable for a house or even a community centre, sports hall or scout hut. On top of this Alex can offer a mini disco and games, balloon models and even face painting. This level of services means that if you have a 2 hrs long party, you can put your feet up and let Alex take care of everything. Alex makes things as easy as possible and offers comprehensive prices, easy communication and no hassle.